When it comes to creating your ideal home or office environment, you want to create a space that lights you up every time you walk through the doors. …and full of wonder that you get to enjoy this one-of-a-kind place you’ve created for yourself, one that inspires you to be your best self and do your best work. My goal is to create that feeling with each piece of art I make. Hi, I’m Sylvia Lippmann, a contemporary abstract painter best known for art that is colorful, lively and energetic. I like that abstract painting requires a leap of faith. It compels both artist and viewer to move beyond the familiar concrete world of reality and enter an intuitive, imaginative state of mind. I try to express the energy, abundance, and fleetingness of life through bright colors and brushstrokes. I’m inspired by nature’s organic forms and rhythms, as well as my own inner feelings and experiences. You can read more about my approach to creating art by checking out my Artist Statement. 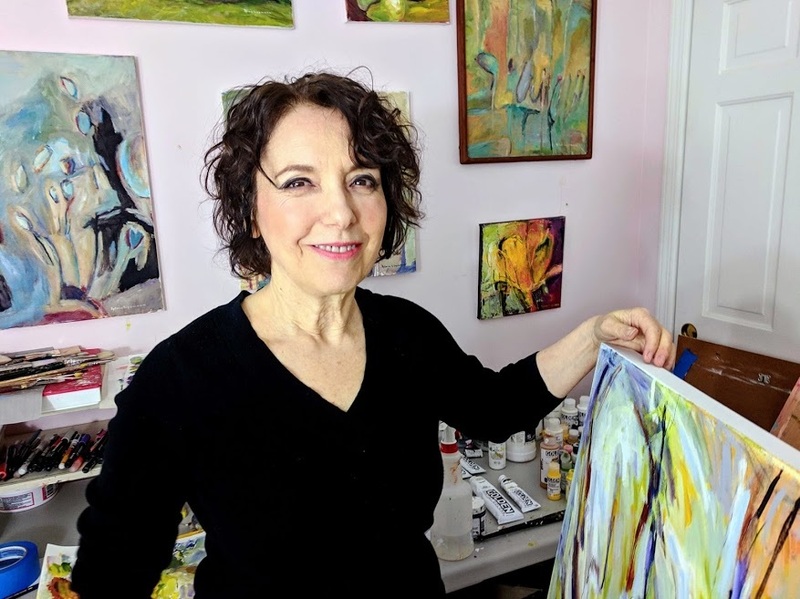 If you like what you see here, I invite you to sign up for my Energetic Abstracts newsletter for a first hand look at my latest works, a behind-the-scenes-peek at paintings in progress, plus exclusive offers I only share with my subscribers. Although I initially devoted most of my time to painting florals and landscapes, I became more and more drawn to non-representational painting as an effective and satisfying way to express my emotions and experiences. I was a shy, introverted teen who began painting in high school. I embraced painting as a form of self-expression that didn’t require me to talk to people! These days, I am more interested in avoiding my own mental conversations while painting. As I stand before a blank canvas, I take the time to quiet my mind, release my expectations, and open my heart to infinite possibilities. I then enter the ever-changing stream of experience while striving to express the fluidity of that experience. I am a primarily self-taught artist who has studied privately with several abstract painters. Specific artists that influence my work include Richard Diebenkorn, Georgia O’Keefe, Helen Frankenthaler, Arshile Gorky, and Franz Kline. Before becoming a full-time artist, I worked as a special education teacher and community college coordinator. I live in a suburb of Chicago with my husband Dan. We are the parents of three grown children, and the new grandparents of a beautiful baby boy. I enjoy having easy access to the Art Institute of Chicago, where I find continual inspiration.